The recent revelations contained in the court-ordered release of documents relating to the sexual abuse of minors by clergy in Los Angeles might, at first glance, seem to be a case of “nothing new.” Sadly, for many Americans, the sexual abuse of minors by some priests is no longer a surprise. But the release of these records marks one of the few times that reams of documents are available for public viewing—in this case, on the archdiocesan Web site. 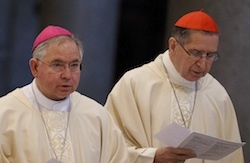 The files, which Archbishop José Gomez said make for “brutal and painful reading,” should be read by every concerned priest, sister, brother and Catholic lay worker, not to mention bishops and archbishops. They detail decades of outrage by parents, as well as efforts by well-intentioned priests and others to remove abusive priests from ministry. The records also appear to show attempts to shield abusers from the proper law enforcement agencies. This is a rare opportunity to trace from its earliest days the way that such horrific crimes affect an individual, a family, a community. Also new is Archbishop Gomez’s decision to limit Cardinal Roger Mahony’s “administrative and public” duties. While Cardinal Mahony is still a priest in good standing, he will no longer preside at confirmations, a typical function of retired bishops. Archbishop Gomez also accepted the resignation of Bishop Thomas Curry, the auxiliary bishop of Santa Barbara. Typically, bishops defend their predecessors; in this case Archbishop Gomez felt it necessary to hold these leaders accountable, thinking this is more in line with what Catholics expect. The example of Cardinal Bernard Law serving for many years as archpriest of a high-profile church in Rome following his resignation seemed unjust to many. Those who commit crimes of abuse should face the law; those in authority who fail to respond adequately should similarly be held accountable. The recovery of King Richard III’s body, which had lain under a parking lot in Leicester, England, for over five centuries, is a gentle reminder that legendary locations often have some basis in fact. Richard’s body was thought to have been located near a church not far from Bosworth Field, the site of his death during a battle against Henry Tudor, and there it was. Many visitors to the Holy Land, Rome and other holy sites know this phenomenon. They are often reminded by guidebooks that legendary sites may be more historically sound than one suspects. Until the 19th century, for instance, many scholars believed that the pool of Bethesda, where Jesus healed a paralyzed man, was a fanciful place. The pool’s five porticoes mentioned in John’s Gospel were often considered mere symbols of the five books of Moses. But excavations later uncovered a pool in Jerusalem featuring five porticoes. St. Peter’s tomb in Rome is another “reputed” location that ended up being precisely where legend had placed it. Of course many legendary sites have absolutely no basis in fact. But legendary sites deserve the benefit of the doubt for several reasons. First, people in antiquity (and in the Middle Ages) did not move around as much as we moderns, and so when pilgrims arrived, it was easy for locals to point out where something had happened. Second, the more extraordinary the event the more likely it would be recalled. (The brother of the woman with the hemorrhage would have remembered where his sister was healed.) We may underestimate the accuracy of oral traditions and the intelligence of our ancestors. The next time someone sniffs at a legendary holy site, don’t sniff back. “The guerrilla is the fish. The people are the sea. If you cannot catch the fish, you have to drain the sea.” That was the memorable, inhuman policy of Efraín Ríos Montt during his bloody tenure as political overseer of Guatemala’s brutal civil war in 1982. That conflict officially ended in 1996. More than 200,000 were killed over decades of bloodshed, which, it must be noted, was aided and abetted by the policies of successive administrations in the United States. Guatemala’s Law of National Reconciliation helped preserve the peace in 1996 and offered amnesty for “political crimes” committed during the war; but it excluded genocide, torture and other offenses not subject to statutes of limitation under international law. It was still a bit of shock on Jan. 26, however, when a Guatemalan judge ruled that Mr. Ríos Montt could finally be brought to trial. At the age of 86, he will be forced to account for ordering the killing of more than 1,700 Mayan villagers during his 18-month reign. The trial will be notable for a number of reasons. The first is that it is happening at all. It represents the first domestic prosecution of a one-time head of state on charges of genocide, suggesting that international tribunals are not the only avenues for justice. Mr. Ríos Montt’s postwar career is a perfect example of why it is so difficult to pursue such cases when the victims are co-nationalists of the offenders. The general avoided arrest for years by taking advantage of congressional immunity, Guatemala’s weak judiciary, the nation’s reluctance to confront its past and, frankly, fear. The general’s impunity has finally come to an end. This article also appeared in print, under the headline "Current Comment," in the March 4, 2013 issue.